Buckets are one of the most commonly used attachments for compact equipment, specifically compact track loaders and skid-steer loaders. While they may seem like a one-size-fits-all attachment, there are many bucket types to choose from depending on your application. Before selecting a loader bucket, evaluate the weight and capacity. Then, consider the application the bucket will be used in, the density of the heaviest material, the accessories that can be used and the coupling systems for easy attachment changes. Choosing the right bucket can go a long way toward meeting your daily production goals. Before performing tasks like loading, carrying and stockpiling, determine the bucket weight and capacity. Calculate the average density of the material to be moved, and then compare that to the tipping load and lifting capacity of the loader to ensure the material can be moved safely. If you are working with different types of materials, spec the bucket based on the heaviest material it will handle. Pushing a machine beyond these limits can accelerate wear, affect machine durability and significantly lower your return on investment. 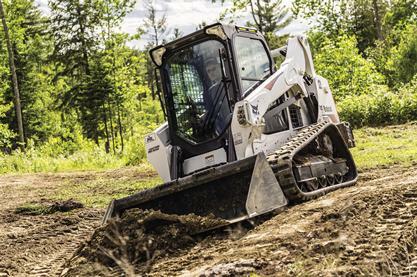 Bucket choices for compact track loaders and skid-steer loaders are numerous, so it’s important that you understand the different styles to best meet your needs. For bulk applications, a traditional dirt bucket is a popular choice. Dirt buckets are rugged and durable, making them a good choice for digging as well as moving dirt and rocks. The most common bucket design is a general purpose bucket for maximum filling and material retention. This design is ideal for light-duty grading and leveling applications as well as day-to-day material handling. They offer good breakout force, especially when working on general aggregates in construction and municipal applications. For more abrasive applications, consider pairing your loader with a heavy-duty or severe-duty bucket. Typically, they are designed for heavy-duty grading and leveling as well as moving higher-density materials in construction and industrial applications. If you are looking to move larger loads with smaller densities, a snow or light material bucket may be an economical solution. Light material buckets offer higher capacities than general purpose buckets, making them ideal for lifting snow, mulch or other light materials. These buckets are primarily used in snow applications. A popular choice in leveling and grading applications, a low profile bucket has a longer lip and lower back for exceptional cutting-edge visibility when working in tight spaces. If your jobsite calls for a different bucket style and design, look at specialty buckets. Many compact equipment manufacturers make a variety of unique buckets, including rock and combination (or 4-in-1) buckets. Rock buckets work well for handling rocks and debris in construction applications. This type of bucket features tines to easily separate materials while the soil sifts through. Combination buckets are versatile attachments with multiple functions, including loading, grappling, dozing, leveling and digging. To help make the best decision when selecting a bucket, visit your local dealer. Cut through material more easily with ground engaging tools, such as bucket teeth. Many manufacturers offer a vast number of interchangeable bolt-on teeth options for specific buckets. Heavier-duty buckets, such as rock buckets, typically feature weld-on teeth to reduce wear. Replaceable cutting edges and extra guarding can be added to buckets to protect and promote overall productivity. There are times when more than one bucket may be right for your application. On most manufacturers’ machines, an attachment quick-change mechanism is standard to easily change buckets. While these systems can save you time, consider adding a powered quick-attach mechanism to your loaders. These mechanisms provide many more efficiencies by allowing operators to rapidly change buckets or other non-hydraulic attachments from the comfort and security of a cab. Selecting the right loader bucket can increase your productivity and reduce operating costs. Evaluate the bucket weight and capacity first, then select the bucket design that best matches your application. If you are unsure about material weights or which bucket may be the best choice for your application, contact your local dealer for assistance.